What's this? I can see the Ghostfence all the way from Ald-Ruhn and my fps is above 10. 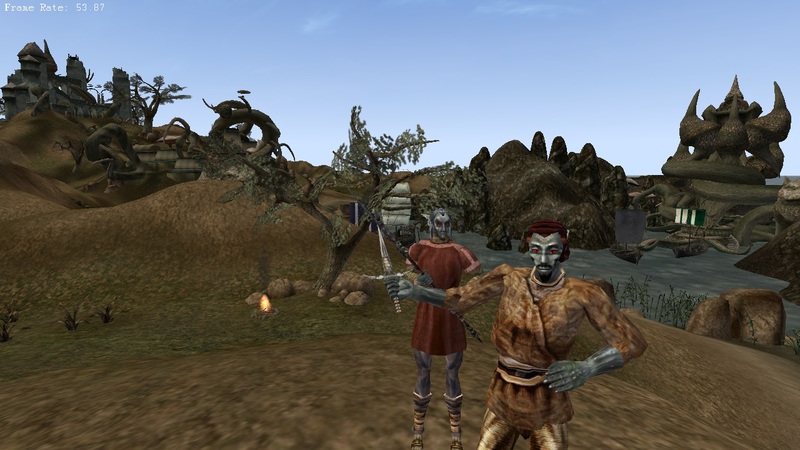 This is OpenMW and not MGE XE, right? 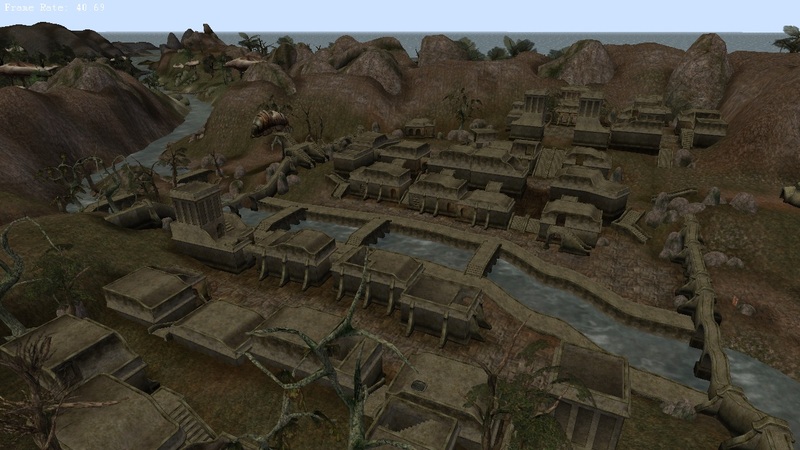 This is OpenMW alright and what you're seeing is made possible by the newest addition from scrawl - distant terrain. 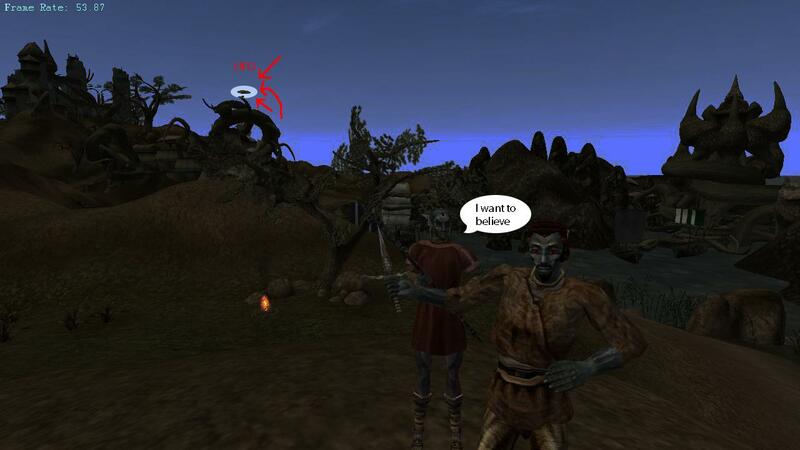 This new feature is available in the latest OpenMW commit and if you're on windows, you can download it from Ace's nightly builds to try it out yourself. So what does it do? In short, it simplifies the land mesh, nothing else. It doesn't touch on scripts, NPCs and statics, but having simplified land certainly lightens the workload to a point where we can have some wiggle room with our view distance. You may have noticed that I've taken use of this in some of the screenshots and loaded enough statics to create the illusion that there are objects as far as the eye can see. You can only see empty land if I purposefully look at something very distant. I must admit, I cheated a little to boost my fps. There is an additional feature called small object culling, which makes it so that objects too tiny are not rendered and my computer's performance is spared. I used this rather aggressively, as I am working with a few years old laptop, but someone with a dedicated gaming rig might get better results while culling less. viewing distance = 6666.0 #Determines how much land is rendered. Add another 6 or 66 to it. small feature culling pixel size = 2.0 #The default is 2, but you may want to change it to 16 at the highest. Improves performance. exterior cell load distance = 1 #This loads statics, NPCs and scripts around you. You may want to set this to 2, 3 or 4.
distant terrain = True #The on-switch to distant terrain. Set this to True. This is by far the most exciting news of my week! 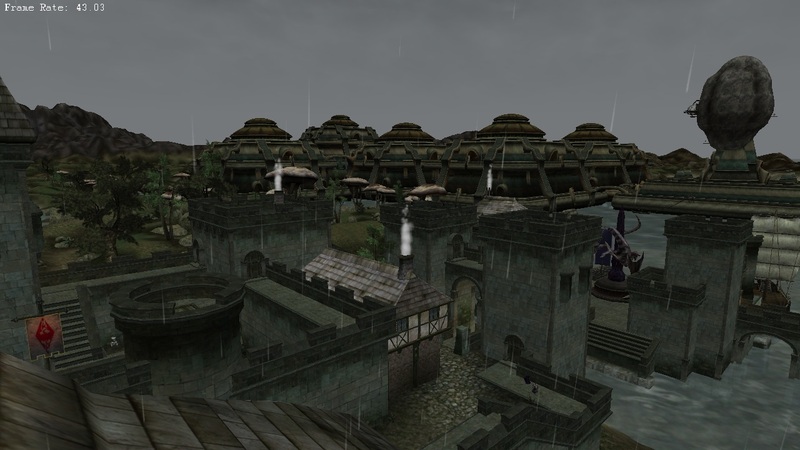 And just in time for me to start feeling like playing some Morrowind again! Also, thanks for the recommendations on tweaking the cfg file. Ghost Fence is animated! This is better than MGEXE (at least for me)! The amount of win is astounding! I get single digit fps when rendering statics that are really far off, but I also have detail and reflections very high, as well as some texture mods, so those are contributing as well. Be that as it may, when optimized and done, this is going to put MGE XE to shame! I'm loving this! I'm going to tinker with a few things to improve fps. If abot's scenic travel mods ever fully work, I can do the ambient travel videos again, and people will be very happy with that! Now all I need is a 360 degree view that doesn't distort everything and I can start making those 360 ambient videos where the viewer can look around all they want! 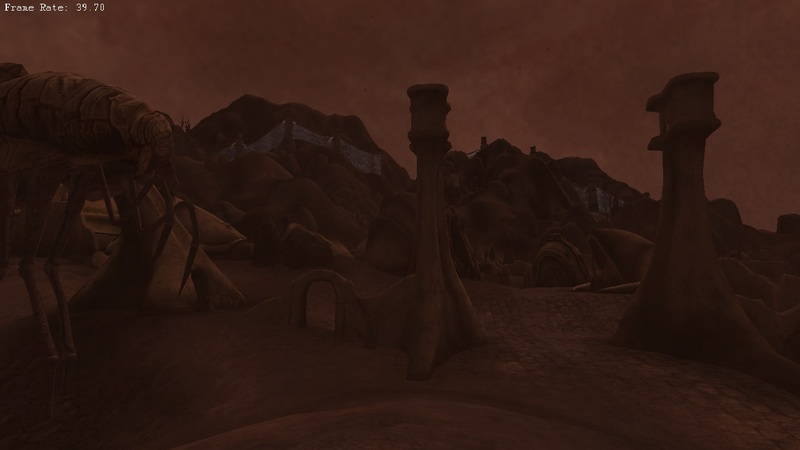 If any of you are interested in that, I have talked to the guy who made the Fish eye mod for quake, and he's willing to help make it happen when OpenMW reaches 1.0, as a post feature. ArashiAganawa wrote: I get single digit fps when rendering statics that are really far off. I just thought of something. I recommend the max small object culling to be 16 pixels, but in my tests I ran my game at 1280x720 aspect ratio. If you are using a higher resolution, you may have to also use higher small object culling to get the same result. *frantically refreshes daily PPA* grr guess I get it tomorrow. Can someone confirm this works on MacOS? Just installed, enabled in settings, but I don't see any difference. Oh I know the issue, it's running a ton of high res packs with hq settings for water reflections and what have you. The point I was trying to make is that, as a feature out of the gate, not yet fully optimized engine, and low end pc, and I could still run it somewhat with distant statics. This is on an older pc, with 5 exterior cells loaded in, using lysol's normal mapped textures. Basically, if it runs now, it will most likely get better and better, and without mods and a high resolution and in game settings, it should run great. 1600x900 is my setting, with AA at 16, water reflections on normal with actors reflected, and lysol's textures, this is promising indeed! without everything turned down to lower end, and without said mods, the fps will be much higher. In Ald-ruhn I get 30 fps, because I'm so far from the water, and no mods effecting the textures either. So it was a simple observation on maxing things out on an old pc. Newer rigs should run great then! Something to note here: Statics in this case, as enabled by exterior grid size with a value of anything greater than one are the full meshes, rendering even further away, this also enables all actors and scripts and activators for anything beyond the grid you are normally seeing, meaning that it is running computations on close to twice the number of cells for each higher increment in that setting. Within that grid of cells, I highly suspect that the fully detailed terrain is still being rendered, as evidenced on how that feature acts when distant terrain is disabled. 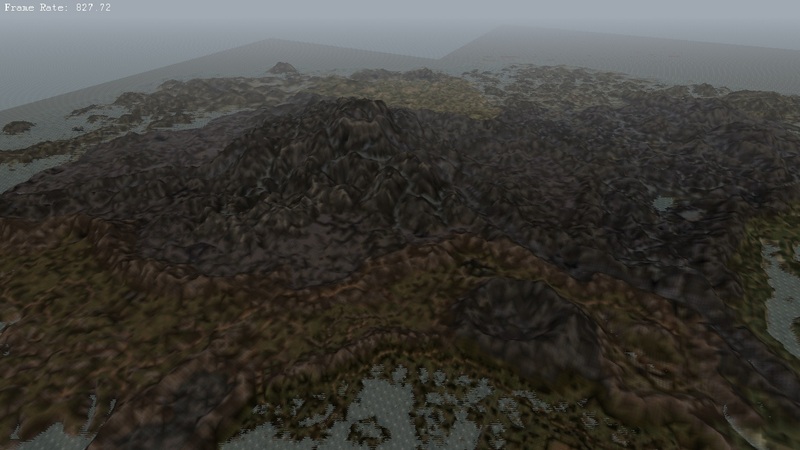 I don't know what the plans are, but I am sure that at some point, there will be additional work to enable simplified, LOD statics that will make the distant terrain look more lively without sacrificing this much performance.